HSUS, PETA, Best Friends, and the never ending whining about the "trolls" and "sockpuppets"
legislators went to for the writing of our "shelter standards" law called CAPA. Now let's look at how many animals the ASPCA could save at that same rate. each year, 1/4 of those animals would be 1 million. He appears to be off by about 711,538 animals. This must be the "new math" of the No-Kill movement. one of those tiny little band-aids you place on a pin prick. donations would drop tremendously anyway. So the logic is just ludicrous. investigations, bickering, and creating an environment that is harmful to our animals. as well as representing our state assisting other states when they make their decision about CAPA. “The Humane Society of the United States is thankful for the assistance of New Jersey SPCA andKent County SPCA. With the help of our partners, our response to this disaster hasresulted in the rescue of hundreds of animals in New York and New Jersey,” - The Paramus Post"
What Does No-Kill Spend Their Money On? Dollars & Sense discussed above. only $22,898 in awards and grants. those $500 jeans. So the movement needs funds to try to silence anyone that disagrees and speaks out about their tactics against organizations like PETA and HSUS. 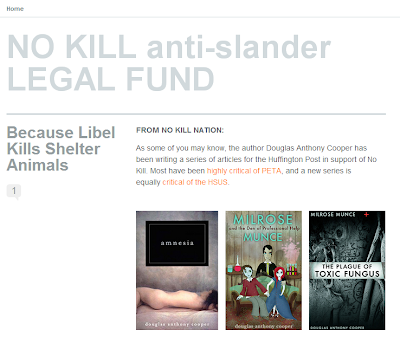 "In response to this — and other efforts to undermine the No Kill community — we have setup a fund to counteract slander and libel. This will be a sum of money, equally divided between No Kill Nation and the No Kill Advocacy Center. It will be put towards efforts (already underway, and successful) to sue those who spread libelous disinformation about No Kill. in our bank account. Alternately, you can leave a donation through PayPal, via the link at the bottom. on a website to promote a fiction author and threaten dissenters. This is all charity fraud. 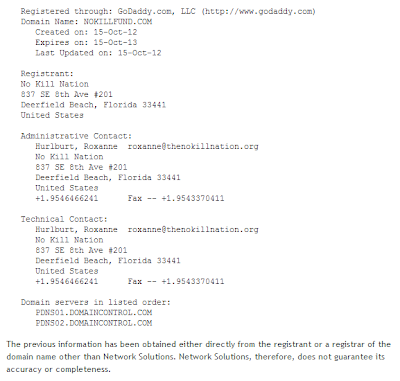 These are businesses performing business operations and falsely claiming charitable status. They are also lobbying and charitable laws are strict on how much of the activity and money goes to lobbying. 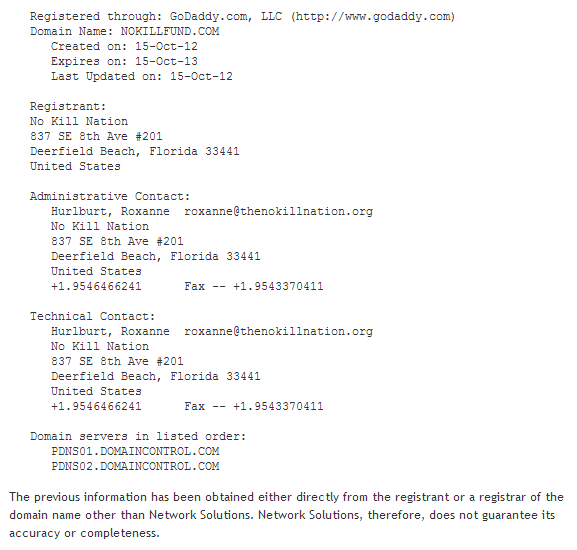 THey alsdo need to be registering as lobbyists, and they are breaking rthose laws in both state and federal law. They also don't own any No Kill brand. It was around long before them. Suing people will however do nothing more for them than expose this fraud, because when they persecute people with harassing lawsuits they only make people speak out more and do more research and digging. This kind of activity will hurt them, and they seem to be too stupid to figure this out. Winograd No Kill is clearly doing nothing but committing fraud to enrich the people running it. They are providing ZERO services to animals- no spays or neuters being paid for, no shelters being opened, no spay neuter clinics, nothing. It just goes into their pockets and lobbying and that is illegal. I still can't believwe they are trying to get breeders and rescue people to give money to rich people like Winograd and his associates to defend themselves when they do illegal or corrupt things. Won't this "legal fund money" be used to refund the rich man who funded his wife's lawyer with a loan? I thought I read about that money trick somewhere, some sort of money game. In other words, into the pockets of Winograd's associates to benefit them personally. Excuse me while i fall on the floor laughing. the breeders and some childishly gullible no killers are being asked to give their money to refund the loan for the lawyers to sue NO KILL RESCUERS that are supposed to be spending their money already caring for the pets so Winograd claims the credit and then gets them to buy his junky books and pay for his junky seminars? I realize that breeders have a reputation for not being too smart, but Winograd now has them looking like complete fools. Breeders paying for a few rich people to fool around and have big egos.